Go to visit the website sysco.com/careers and you will be given two application methods. 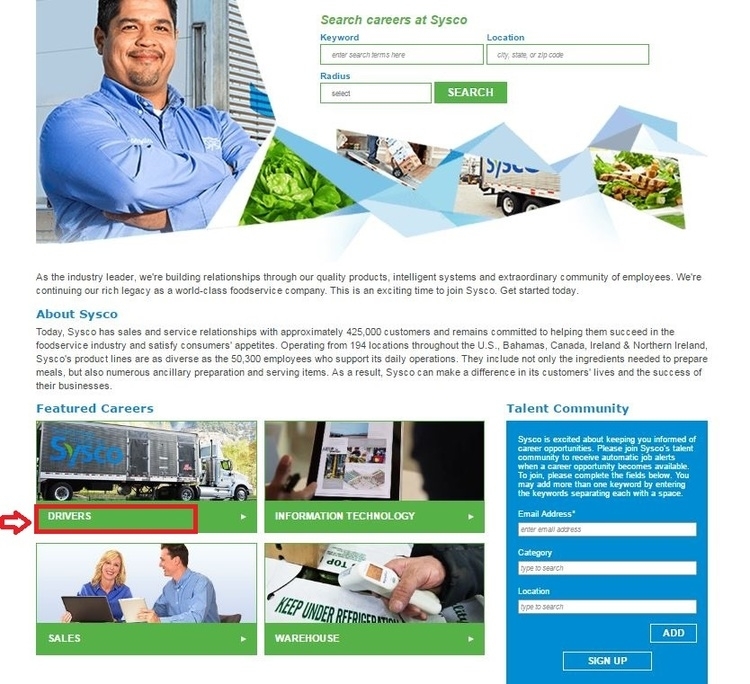 First, you may enter the key words, location or radius in the box accordingly and click the SEARCH button to search careers at Sysco. Second, you can find featured career types on this page, just choose one and click it to continue. Here the second method will be taken as an example to tell you how to apply for a job at Sysco in a rapid way. In this step you will enter into a page on which positions under the types you chose are listed. Select a position that suits you the best in accordance with your qualifications and interests and click it to go to the next step. Also you can filter the search results by adding state,city and company name on the left sidebar so as to make search results more accurate. After the position has been chosen, you will enter a job description page. 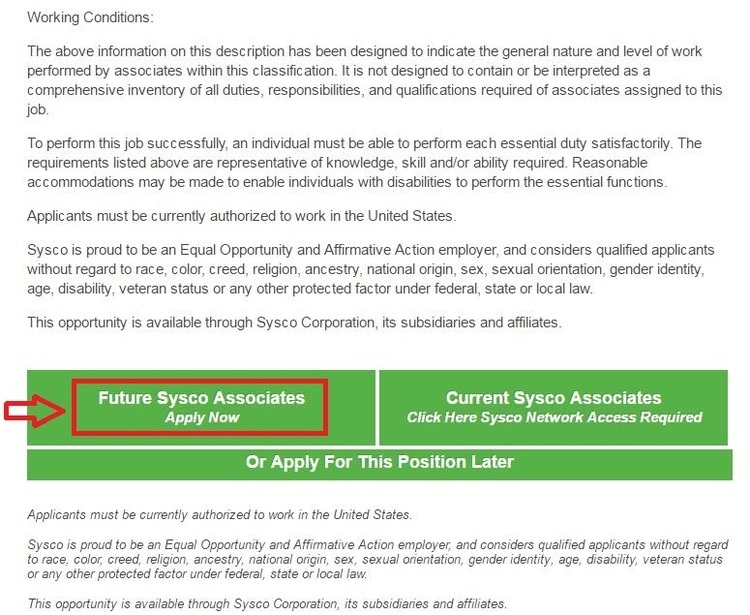 Please browse this page carefully to learn more about the job you are applying for and then click the button "Future Sysco Associates" to go forward. You are required to create a candidate card by providing your name, email address, state of residence and interested job category. Then click the APPLY NOW button to continue. With the fourth step finished, you will enter a job description page again, just read it and click the APPLY button. Then You have to create a new account for further application if you are a new candidate. Enter your Email address, password, name and verification code and click the blue button to get your account built. This step is very important but a little bit complex. 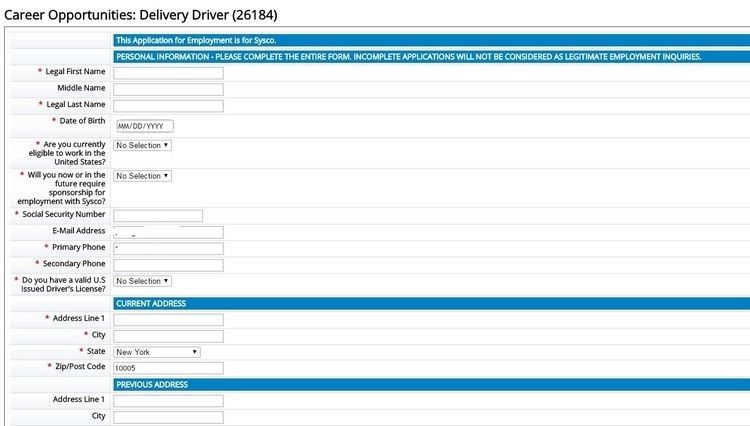 You need to upload a resume from your computer at first, and then fill out the profile form step by step and click the NEXT button. Here your personal information, contact information, education background, employment experience, disability status, ethnicity and application consent are required. You are required to reassure and provide more information in this step to make your candidate profile more intact. Click the NEXT button at the right lower side of this page to go forward. When the seven steps above are finished, you've made your online application fully completed. You can choose to the job search page or return to jobs you applied for by clicking the blue buttons accordingly. 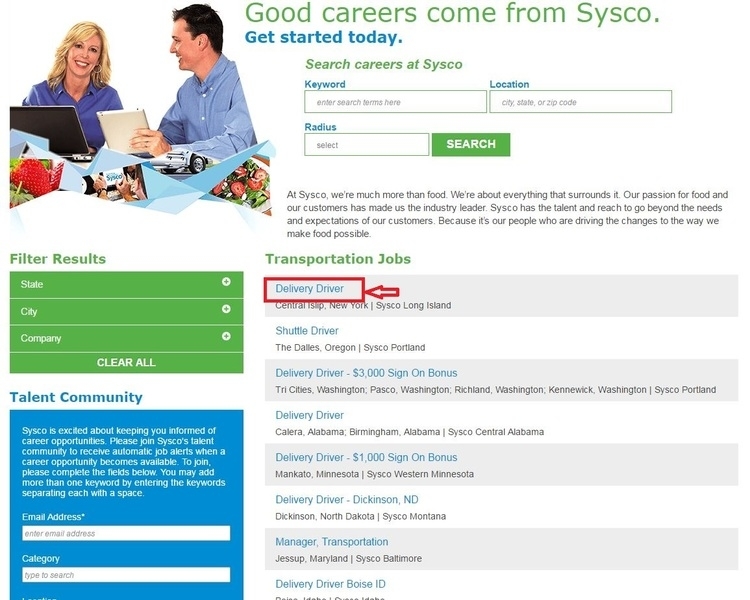 Click sysco.com/careers to apply for Sysco jobs online.